Visitors welcome during scheduled appointments, events, classes, and Open Studio Hours. "Photography gives me a means to feel peace and serenity, sentiments I want to share with others. Inspiration for my work comes from the beauty of nature. By capturing it through the lens of the camera, I can encourage and inspire the viewer to take a second look and appreciate God's handiwork. The subjects of my photographs are scenes from the natural world around me; I spotlight patterns and textures, as well as examples fo rustic and timeless structures formed by man. Waterfalls, rock formations, flowers, and forests, as well as old buildings that are the results of the craftsman's hands, are among my favorites. Capturing the mood of wet, soaked pavement, or a bird searching for food, or the moment a crocus bursts through the snow-covered ground, allows me to fulfill my desire to lead viewers to appreciate the seasons, beauty, and quiet blessings of life." 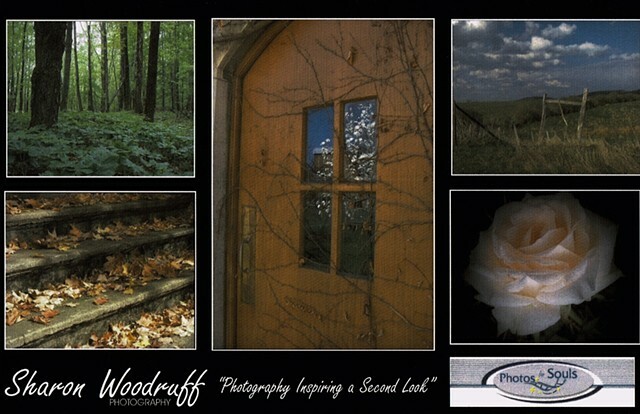 Sharon Woodruff is a devoted wife, mother, and grandmother, dedicated to using her photography to bring peace and reflection to searching souls. She lives with her husband in Alfred Station, NY. High Resolution photos are available for purchase framed or unframed. Contact the Fountain Arts Center to purchase high resolution prints framed or unframed. Prints can also be customized with your favorite inspirational quotes. Email: wjskinner@thefountainartscenter.org for more information. This Collection of Photography is part of the 2018 Artists Among Us Program presented by teh Fountain Arts Center, and its host sites.